Justine and her husband were subsistence farmers when they began working with Give Us Wings. The family of 9 barely survived on the little food they were able to grow. Then her husband passed away and Justine became the sole-provider for her family. Her family desperately needed a more reliable source of income. So Justine enrolled in the Give Us Wings Building Business for Family Sustainability program where she received business training, mentoring, grants and small interest-free loans to start her own business. Now her life is improving! Give Us Wings met Justine and several other families in 1999. They were living in extreme poverty in a small rural farming community in southeastern Uganda. A few of the more fortunate families lived in semi-permanent houses made of metal sheets, but most lived in grass thatched houses with no windows and only a torn sheet for a door. The parents and children all slept in one room on mats; those who could afford decent bedding slept on thin mattresses. Many of these families ate only once a day because that is all the food they had. Most of the families are subsistence farmers who barely survive on the crops they grow, such as rice, ground nuts (peanuts), cassava, potatoes, maize (corn), and beans. Justine and the others asked Give Us Wings for help to improve their lives. Give Us Wings helped them form a group, Makimoth, through which they support and encourage each other and work together to find solutions for their most pressing problems. 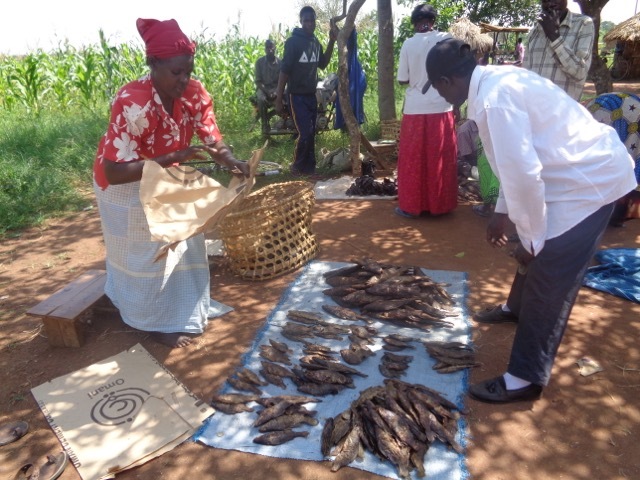 Give Us Wings provided organic farming training, literacy training and some basic business training to the Makimoth members. Many families, like Justine’s family, are waiting to enroll in the Give Us Wings Building Business for Family Sustainability program. Each $1,000 of your generous donation will allow Give Us Wings to enroll another family in the business loan program and launch them on the path of building a stronger, better future for their families. Justine at the market selling smoked fish.